Weaver Leather has an average of 4.3 million pieces of hardware and 50,000 pieces of leather in stock at any given time. As a manufacturer with 45 years of experience handcrafting quality leather goods, we’ve learned a thing a two along the way about the importance of having the right supplies for the job. 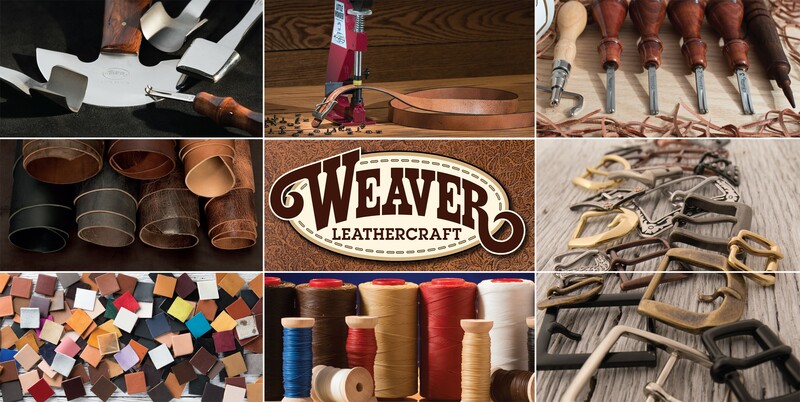 When you purchase leather and supplies from Weaver Leather, you can be confident in knowing that they were hand-picked by our team of experts for the ultimate in performance and quality. As a leather supplier, Weaver Leather is unique in that we cut, sew and work with many of the leathers you’ll find on our website. We source leather from some of the world’s top tanneries and work with them to develop high-quality leathers that ensure beautiful end projects. Our team knows the right hardware can make all the difference in the beauty and function of your end product. Our team works closely with our suppliers to bring you hardware that meets our strict specifications and quality requirements. If you look closely at our hardware items, you’ll notice that our dimensions are oftentimes thicker than others you’ll find on the market. From hobbyists to professionals, everyone will find just the right tools to meet their needs and budget. A great all around selection from Master Tools, C.S. Osborne, Horse Shoe Brand and more ensure everyone has access to the same tools our craftspeople depend on every day. With a shop full of machines our team counts on to enhance productivity, we understand the importance of choosing the right machines and having expert technical support available if you ever have a problem or questions. From sewing machines from Adler to Weaver-built Master Tools machines, we have machines to make any task easier.